Wow. I don't use long putters, but this one is extremely nice. I am honestly going to put a 34" version of this guy on my Father's Day wish list. Very, very nice putter. I'm not sure why, but I dig the milled face on putters nowadays, and I am a sucker for a mallet that lines up nicely. The Kombi really draws your eye and seems to hone in a great line to the cup easily. The red "T" shape lets you easily find the ball's center point and produce a nice backstroke and follow through. 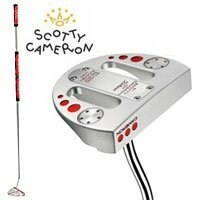 Now we all know that Scotty Camerons are on the higher end of the price spectrum, but this one is worth checking out -- regardless of the size that you choose. There are three sweet-looking weights on the bottom of this putter too that seem to do a fantastic job of balancing the mallet and giving it a very solid feel while putting. The model I used had a nice offset shaft that allowed very good visibility at address, and the ball seemed to click off the head at a great roll without any problems. This is an extremely nice putter that would make any golfer proud to pull the cover off.